Derek Schmidt grew up in Honolulu, Hawaii. Derek was part of the Honolulu School District, where he won a lawsuit against the system for not providing him adequate support to ensure a proper education. After winning his lawsuit he was awarded monies to provide him with support to live a full life. Derek came to our agency, Jay Nolan community Services, in the year 2000. At that time he received 2:1 support. Derek had two staff with him at all times because he needed intense behavioral supports. Slowly, over time and building his circle of support, he no longer has two staff! SLS services requires the “right” match. While this takes time to culminate, Derek now has a full life. He recently moved into a home that allows him the freedom of space and its ability to accommodate his movements. Since his move, he no longer runs out of his home and into traffic. Derek has also had the opportunity to spend time with Ruth Meyers, M.D. where there was a recommendation to have his blood work checked. This is the first time that Derek ever had a full physical before. 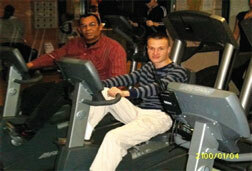 While it took three staff members to encourage him to proceed with the test, Derek was able to achieve his goal. After further tests, Derek was put on a low dose of medication which has seemed to help him greatly with his nerves. He can now go throughout his day without jumping, open car doors, pulling staff’s hair, screaming, and he has even gained able to increase his weight from 97lbs to 99 lbs. At his last circle meeting, Derek was able, through the use of facilitated communication, to tell his circle of all the joy that he is experiencing in his life and thanked his circle of support for being there for him. As you can see by his picture, there are a lot of “firsts” for Derek. He is able to go to the gym and ride an exercise bike, this is the first time in his life that he has been able to do this in this type of setting. While these may be small hurdles to you, this is a huge accomplishment for Derek and his father is so proud!